This sky map shows where to look in the southeastern sky to spot Venus and the moon on Dec. 31, 2010 just before dawn. This view is from the New York City region at about 4 a.m. EST. 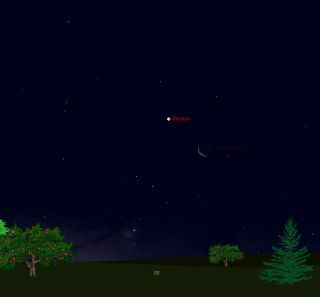 Forearly risers planning to get a jump on ringing in 2011 in North America, anattractive cosmic sight in the predawn sky will precede New Year's Eve: thebrilliant planet Venus shining in the vicinity of a lovely crescent moon. Venuswill rise first, early Friday shortly after 3:30 a.m. EST (0830 GMT), followedabout 15 minutes later by the slender sliver of the waning crescent moon. Theeye-catching duo will quickly gain altitude, and with the arrival of dawn acouple of hours later they will appear roughly one-quarter of the way up fromthe southeast horizon to the overhead point (known as the zenith). Thissky map shows how Venus and the moon should appear in the southeastern skyto skywatchers with clear weather early Friday. Butthe two will attract immediate attention because of their great brightness.Astronomers measure the brightness of objects in the sky based on theirmagnitude ? the lower an object's magnitude number, the brighter it is. Venusshines at magnitude of minus-4.5, which makes it more than seventeen timesbrighter than Sirius, the brighteststar in the night sky. Themoon will be less than 3 1/2 days from new phase and about 16 percentilluminated. Look for the beautiful phenomenon known as "earthshine"? sunlightreflected by the Earth, directed toward the moon and dimly illuminating itsdark portion with a faint gray-blue glow. Thateffect should give an almost three-dimensional appearance to the moon,enhancing the overall scene. Themoon?s proximity relative to Venus will give you an excellent chance to try toglimpse Venus during the daytime. Just take note of where Venus is relative tothe moon. Afterthe sun comes up, locate the moon and then look roughly "one fist"above and to its left. Venus will be visible as a tiny white speck against theblue sky background. Periodicallycheck the sky during the day and see if you can still see both. If you do,you'll join the elite handful of skywatchers who can claim to have spottedVenus during the daytime hours. RobertRoy Britt, editor-in-chief of SPACE.com's parent company, Tech Media Network,recently joined the group of Venus daytime spotters along with his family. Theview earlier this month, he said, was surprising. "Venusappeared as a stark pinpoint of white light against the blue morning sky,"Britt wrote. "It is extremely hard to find if you don't know exactly whereto look, but once you find it, it's startling how bright it is." JoeRao serves as an instructor and guest lecturer at New York's HaydenPlanetarium. He writes about astronomy for The New York Times and otherpublications, and he is also an on-camera meteorologist for News 12Westchester, New York.